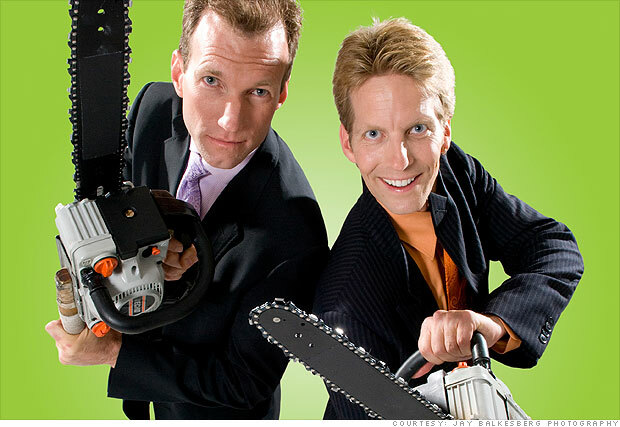 Owen Morse (left) and John Wee juggle chainsaws and have performed for Prince Charles, who called them "clever." Company: The Passing Zone, Inc.
Jon Wee and Owen Morse made great use of their respective college degrees in economics and psychology when they paired up in 1988. They became chainsaw jugglers. This duo, known as The Passing Zone, also juggles sharp knives, flaming torches and fills garbage bags while riding Segways. They perform mostly for corporate events, focusing on themes like "juggling priorities" and "keeping lots of balls in the air." "We use real chainsaws straight from the hardware store and it is truly dangerous," said Wee, who admits they have both cut themselves numerous times. "We just try not to let our audience see any blood." Their act has gained them appearances on "The Tonight Show," "The Today Show," The Miss America Pageant and many others. They've even performed at The White House and before Prince Charles who deemed them "clever" and expressed relief he wasn't seated in the front row as sharp objects flew. The team appears at more than 100 corporate events a year for such companies as Boeing, Hewlett-Packard and Mattel. They even offer a juggling workshop to attendees, as a team-building exercise. "People begin the workshops protesting that they can't juggle, but we teach them slowly -- one small goal at a time," said Morse. "Soon they are realizing their own success and seeing that all things are possible." Sound business principles mixed with juggling appear to be a winning concept. The Passing Zone's projected revenue for 2012 is $1.2 million. "That's a long way from where we started, passing the hat for a handful of quarters," said Wee.